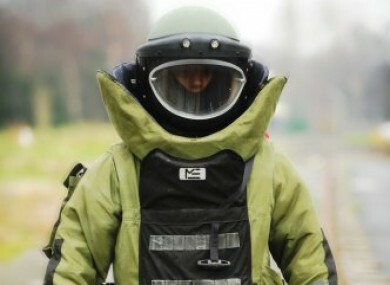 AN ARMY BOMB disposal unit dealt with a highly explosive chemical at a school in Sutton, Dublin earlier today. The team was deployed at 10am this morning and returned to base shortly after 11am. The chemical is a common substance found in school labs, called 2,4 dinitrophenylhydrazine, or ‘Brady’s re-agent’. It can become unstable over time if it dries out and it is also relatively sensitive to shock and friction so it can detonate if subjected to shock, like a fall. A defence forces spokesperson confirmed that a controlled explosion of the substance was carried out by the team. Email “Bomb squad deals with highly explosive chemical at Dublin school ”. Feedback on “Bomb squad deals with highly explosive chemical at Dublin school ”.